Located to the south of the towns of Herten and Recklinghausen, Emscherbruch landscape park is a new 750-hectare area for leisure and recreation which has been developed on the Emscher river in a partially wooded landscape excessively shaped by industry and mining . The main component in the park is the Hoheward slag heap, which has already been partially recultivated but where dumping still continues. Together with the already greened Hoppenbruch slag heap, it will form the largest mining slag heap landscape in Europe. Mining meant that the “bottommost” was brought to the top and piled up in layers: other layers of soil subsided: This layering of the landscape became the leitmotiv for the “New Horizons” master plan for Emscherbruch park. The core projects of Ewald business park, Hoheward slag heap and Hochlarmark garden strip are currently being realised and are scheduled to be completed in 2008. Further projects in the landscape park will be developed in the middle or long term (Emscher river revitalisation). The reclaimed land will become a firm component of local recreation for the adjoining town districts. 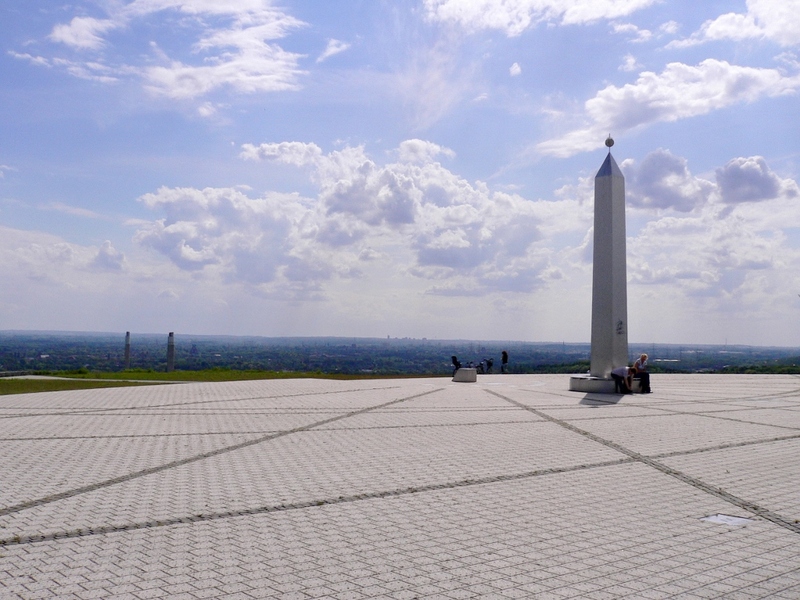 Visitors will come from throughout the region to experience attractions such as the obelisk/sundial or the planned observatory on Hoheward slag heap. Located to the south of the towns of Herten and Recklinghausen, Emscherbruch landscape park is a new 750-hectare area for leisure and recreation which has been developed in a partially wooded landscape excessively shaped by industry and mining. The park is located in the regional green corridor D, which meets up at this point with the east-west green corridor along the Rhine-Herne canal and the section of the Emscher river in Emscher Landschaftspark. The landscape is dominated by the 100-metre-high Hoheward slag heap, parts of which have already been recultivated. When the last load has been dumped here in 2008, the Hoheward slag heap and the neighbouring Hoppenbruch slag heap will form the largest mining slag heap landscape in Europe. Layering the landscape – “putting the bottom at the top” – is a legacy of mining and industry and it was this which became the leitmotiv for the “New Horizons” master plan for Emscherbruch park. Agence Ter (Prof. Henri Bava Paris/Karlsruhe) provided the idea for the master plan. The 160-hectare Hoheward slag heap forms the heart of Emscherbruch park, which features various zones with individual characters. Those areas of the slag heap which have already been recultivated are available for recreation and leisure activities and further areas will be developed in succession following the completion of the continuing process of dumping and recultivation. A 7-kilometre “ring walk” connecting the towns of Herten and Recklinghausen is under construction around the slag heap. The top of the 100-metre-high slag heap is reached by a path with serpentine bends. The “core ring” is formed by the 6-kilometre “balcony walk”, which is located half-way up the slag heap and runs the whole way around it. A total of 11 balconies (steel platforms) with views of the neighbourhood are being erected at important access points. Altogether, over 20 kilometres of new paths for walkers and cyclists will be created during the first phase of construction. An obelisk made of high-grade steel has been erected on the eastern part of the slag heap plateau. The idea and conception for it came from Initiativkreis Horizontastronomie im Ruhrgebiet e.V. (Horizon Astronomy in the Ruhr Area), which has also suggested that further projects in the shape of the Pleiadesconstellation should be located around the slag heap. Standing at a height of 8.50 metres, the obelisk provides the shadow for an enormous horizontal sundial: a white, perfectly round surface 60 metres in diameter with black lines indicating hours and dates. Here visitors can either experience the movement of the sun and the phenomenon of time or simply enjoy the fantastic view. Towards the south, the view stretches across the Ruhr area from Oberhausen to Dortmund. To the north, visitors can look across the Vestische Höhenrücken to the wooded Hohe Mark and Die Haard hills. The highest level of the slag heap – the top horizon – provides the setting for the enactment of the “horizon” theme and for the encounter between sky, earth and human being. The “celestial lake” and “horizon observatory” are ambitious projects whose realisation is being vigorously pursued. 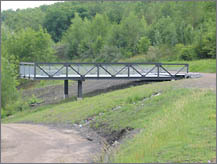 In 2006, the finished parts of the park will be handed over to the public – the Hochlarmark strip of gardens, the eastern and northern flanks, the eastern part of Hoheward slag heap plateau and the Ewald walk. Over 10 kilometres of new paths, 5 balconies and an obelisk/sundial will await the visitor. The combination of Emscherbruch landscape park and Hoheward slag heap will make the area a firm component of local recreation in the towns of Herten and Recklinghausen. Visitors will come from throughout the region to experience the unique development of a slag heap landscape. The obelisk and sundial will be attractions throughout all seasons and will also lend themselves to open-air events. Further development of the landscape park will be concentrated on Hoheward slag heap. Biotope corridors will stretch down to the Emscher river, the revitalisation of which will give rise to a new river landscape. Ewald business park will provide an urban focus. A market square will form the focal point in the ensemble of buildings of the former colliery and a generous, more than 1-kilometre long stretch of water with an accompanying path will lead into the landscape park. The symbols of the park are the winding tower frame of the former Ewald colliery and the wind turbine on Hoppenbruch slag heap. The “triumvirate” will be complete when the horizon observatory is erected. This 50-metre arch above the top of Hoheward slag heap will be visible for miles around – a new landmark!